Being invited to give a plenary lecture at the 7ECM was a great honor and, as Keren Vogtmann said in her beautiful opening lecture on outer spaces, it was also a daunting task. I am thankful to Günter Ziegler for his introduction. When I ask myself in what way I am connected to the person I was thirty years ago, one answer is that it is my long-term friendship with Günter and other people that makes me the same person. My lecture deals with the analysis of Boolean functions in relation to expansion (isoperimetric) properties of subsets of the discrete n-dimensional cube. The lecture has made a subjective selection of some results, proofs, and problems from this area. Yesterday, Leonid Polterovich and I were guests of the exhibition “Transcending Tradition: Jewish Mathematicians in German-Speaking Academic Culture.” I will start by briefly mentioning the great impact of German-Jewish mathematicians on the early history of the Einstein Institute of Mathematics and Physics at the Hebrew University of Jerusalem, my main academic home since the early seventies. In this picture you can see some early faces of our Institute. 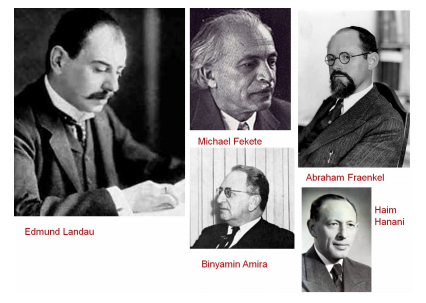 Edmund Landau, the founder and first head of the Institute, moved to Jerusalem from Göttingen in 1927 and moved back to Göttingen a year and a half later. Abraham (Adolf) Halevi Fraenkel moved to Jerusalem from Kiel in 1928 and he can be seen as the father of logic, set theory, and computer science in Israel. My own academic great-grandfather is Michael Fekete, who immigrated to Jerusalem from Budapest in 1928. May great benefit emerge from this house dedicated to pure science, which does not know borders between people and people. And may this awareness emerge from Zion and penetrate the hearts of all those who are still far from this view. 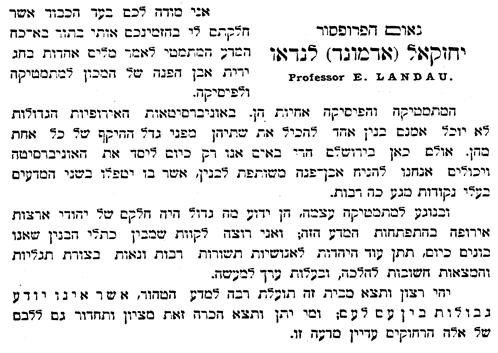 The second document, also from 1925, is probably the first mathematical paper written in Hebrew in modern times. 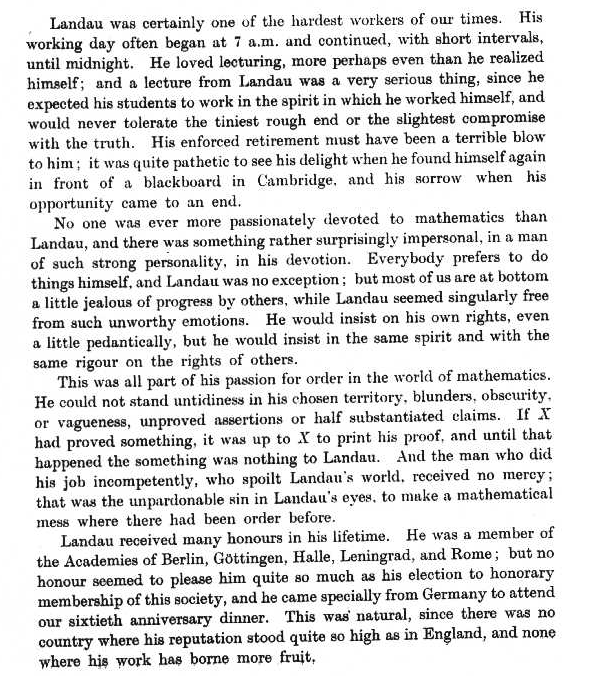 It is devoted to twenty-three problems in number theory and here are its concluding sentences. twenty-three is a prime number, i.e., a very handsome number for us. I am certain that I should not fear to be asked by you, for what purpose does one deal with the theory of numbers and what applications may it have. For we deal with science for the sake of it, and dealing with it was a solace in the days of internal and external war that as Jews and as Germans we fought and still fight today. Satan knows [the answer]. What I mean is that besides God Almighty no one knows the answer, not even my friend Hardy in Oxford. These days, ninety years after Landau’s lecture, we can say that besides God Almighty no one knows the answer and not even our friend James Maynard from Oxford. We can only hope that the situation will change before long. Landau’s hopeful comments were made only nine years after the end of the terrible First World War. He himself died in 1938 in Berlin, after having been stripped of his teaching privileges a few years earlier. I don’t know to what extent the beauty of mathematics was a source of comfort in his last years, but we can assume that this was indeed the case. My life, like the lives of many others of my generation, was overshadowed by the Second World War and the Holocaust and influenced by the quest to come to terms with those horrible events. Here is the videotaped lecture. (and the slides). More sources: The home page of my Institute, and a page about its history; An article in the AMS Notices; A blog post in Hebrew about the 1925 Hebrew University events; Shaul Katz: Berlin roots – Zionist incarnation: The ethos of pure mathematics and the beginnings of the Einstein Institute of Mathematics at the Hebrew University of Jerusalem. Science in Context 17(1/2), 199-234 (2004); A blog post about Yaakov Levitzki and the Amitzur-Levitzki theorem; Schappacher, Norbert: Edmund Landau’s Göttingen — From the life and death of a great mathematical center. Mathematical Intelligencer 13 (1991), 12-18. 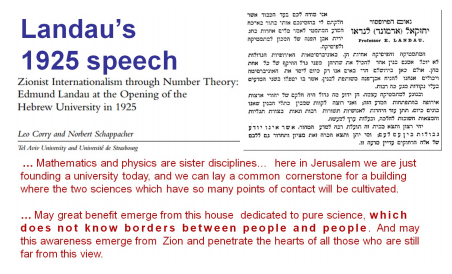 (Talk at the Dedication of the Landau Center for Research in Mathematical Analysis, Jerusalem, Feb. 28th, 1989). A recent post on Tao’s blog related to mathematics, science, scientific relations and recent events. 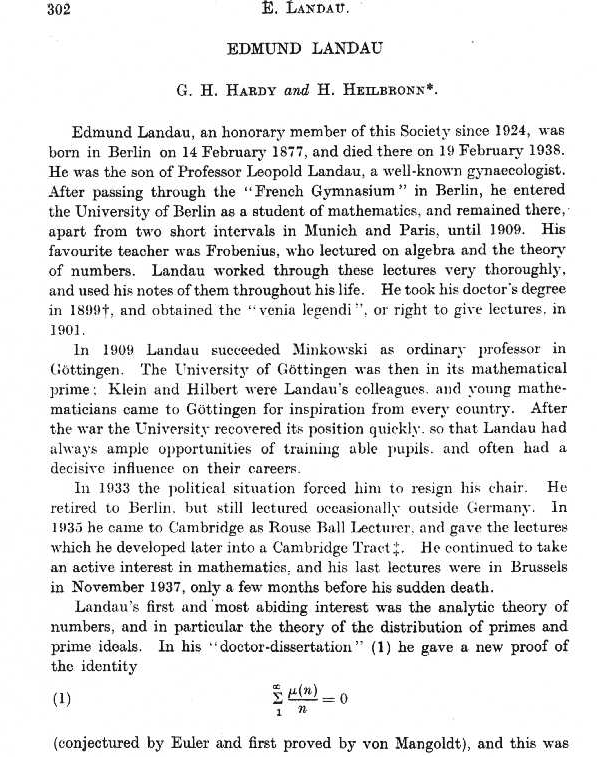 (Below) First and last page of Hardy and Heilborn obituary on Landau. This entry was posted in Academics, Combinatorics, personal and tagged Edmund Landau. Bookmark the permalink. The obituary seems not to mention his stay in Jerusalem…? Springer has published a very nice book with many photographs related to the Transcending Tradition exhibit. I found this book fascinating.